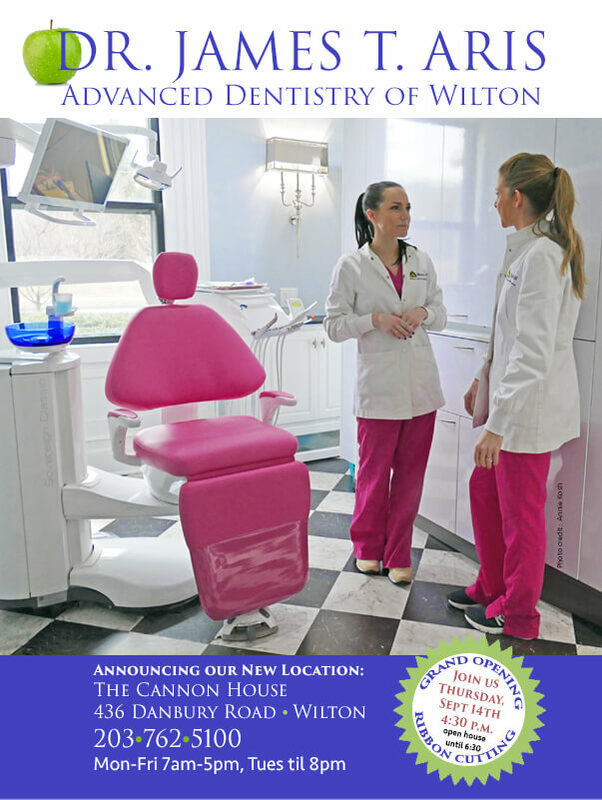 Wilton, CT – September 10, 2017 – A recent example of adaptive use in action will be celebrated with the official Ribbon-Cutting Ceremony at James T. Aris, DMD, MAGD, PC, Advanced Dentistry of Wilton, 436 Danbury Rd., Wilton, this Thursday, September 14, 2017 at 4:30 p.m. followed by an Open House/Chamber of Commerce After-Hours event until 6:30 p.m.
Dr. James T. Aris, owner of Advanced Dentistry of Wilton, recently relocated his Wilton Center dental office of 23 years to the historic Cannon House, an 1835 Greek Revival located at 436 Danbury Road, Wilton, CT. Two influential Wilton families were key characters in the history of the house – the Cannons and the Millers. The Cannon family patriarch, John Cannon, had founded the Cannon Store at the start of the 1800s, believed to have been located where the DALE cannon is at intersection of Cannon and Danbury Roads. His son, George Cannon, took over the store and eventually left 3.75 acres (valued at $470.34) to his eldest daughter, Mary Cannon. She and her husband built the five-bedroom house at 436 Danbury Road circa 1835. In 1878, Mary left her estate to her brother, Charles Cannon, a prominent town leader who was involved in politics and responsible for much development in the Cannondale area–acquiring a US Post Office for Cannon Station and subcontracting the right to expand the Danbury/Norwalk Railroad through the Pimpawaug/Cannondale area. Charles’ daughter Esther Cannon inherited the house along with her husband Samuel Miller, who became president of Gilbert & Bennett. The Cannon House, also known as the Hiram and Mary Cannon Jones House, took eight months to transform into a state-of-the-art dental office. “The Cannon House will better serve our patients with more comfortable rooms,” explains Dr. Aris, “but with the same outstanding dental team and dedication to helping each and every patient achieve and maintain their optimal dental health.” Key to the transformation of the Cannon House were Wilton architect Rob Sanders who brought extensive knowledge in historic preservation to the project; award-winning contractor Wayne Fontaine, of Fontaine Construction in Bethel, who specializes in dental space construction; Patterson Dental; Integrity Systems & Solutions, a computer services company; and Eivind Heggland, of CT Floor Supply in Wilton who refurbished the antique hardwood floors. Dr. Aris is a graduate of the University of Pennsylvania School of Dental Medicine, and among the top one-percent of general dentists in this country who have earned a Mastership from the Academy of General Dentistry. In addition to his Mastership Award, Dr. Aris was named Scholar of the Dawson Academy, an international organization where dentist come together to gain a better understanding of not only teeth, but also the muscles and systems that control them. Dr. Aris completed an intensive one-year course on Advanced Full-Mouth Reconstruction at NYU Linhart Continuing Dental Education, and was a speaker at the Greater New York Dental Meeting. “What I like most about the new space is that our dental team is so excited and proud to work at the Cannon House. It reflects our commitment to the latest technology and education to exceed the expectations of our patients,” emphasizes Aris.